Man and Superman: 100-Page Super Spectacular #1 Review – AiPT! Wolfman has always been a master of making larger than life characters into relatable people, and that gift is on full display in this story. 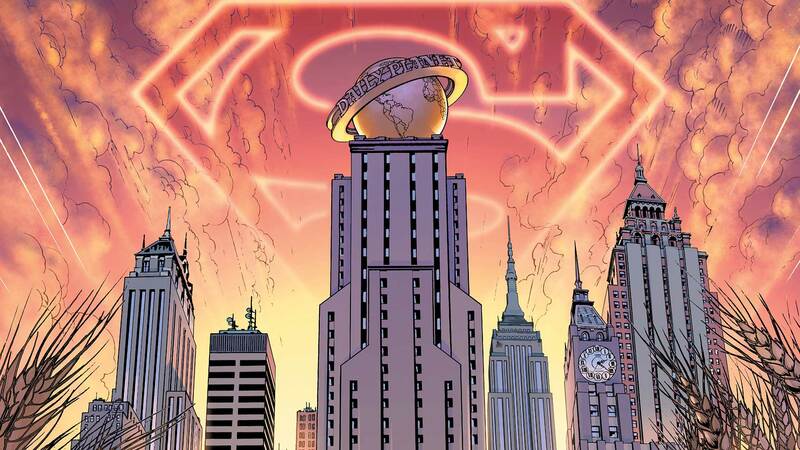 A previously-unpublished Superman story set during the hero’s first days in Metropolis, written by Marv Wolfman? Who could say no to that? Well, as explained in Wolfman’s wonderfully insightful and charmingly self-deprecating foreword, Man and Superman was originally meant to see publication about a decade ago as a four-issue run in Superman Confidential, but the book was sadly canceled before it could be run. Afterwards, the shake-up of DC’s New 52 left this story in a funky place, in terms of canonicity. Now that DC is once again willing to play ball with stories somewhat outside of continuity, this “lost” Superman story can finally see print! And thank goodness it’s here, because it’s a real treat. There are moments in Man and Superman that bring to mind one of my all-time favorite superhero origin stories, Batman: Mask of the Phantasm. I love the sequence in which Clark attempts to do some sleuthing in Metropolis for the first time. He’s knows how his abilities work, but he’s still unsure of his methods or how to proceed with his big debut. We’re used to seeing Clark presenting himself as a bumbling farm boy as a way of covering his identity. In this story, there’s a clumsy side of Superman himself on display that we don’t normally get to see, which opens up Clark Kent in ways that should be very appealing to readers who may normally feel disconnected from the godly superhero. In portraying Clark as a man with incredible power, yet a near-total lack of confidence (at least early on), Claudio Castellini’s art evokes some of Neal Adams’ finest work with the character. Seeing Clark’s silhouette against a wall of flames, there’s a mythical quality to Superman’s first public appearances, a real sense of the world changing. Aided by vibrant coloring from Hi-Fi, the action sequences almost bring to mind the timeless Fleischer Superman cartoons of the ’40s. That’s a lot of comparisons to make, but so much of this book feels like a beautiful synthesis of all of my favorite takes on Superman. The most interesting thing about this comic, though, is how secondary all of the action is to the real meat of the story. So many versions of the character’s origin gloss over the kind of hustle that Clark would have had to show in order to get a job at one of the nation’s top newspapers, so I appreciate that Wolfman found this struggle important enough to feature it as a through line for this tale. Also, as a fan of Lois Lane, it was great to see her talked about in hushed tones by background characters in the issue, even when they were speaking out of jealous derision. It lends her a public admiration and gravitas that is normally reserved for the Big Blue Boy Scout in these types of books. To present her right out of the gate as not only Clark’s equal, but his star to shoot for, is a fantastic choice. She is a hero in her own right. By the time she’s fully introduced, you’ll be wishing DC would give Marv Wolfman an ongoing Lois Lane solo series! There is such a sureness of being to her. Clark may the guy flying around and catching buildings, but this book really sells you on why Lois is Superman’s personal hero. The one thing that keeps this story from being a completely satisfying read is thankfully addressed in Wolfman’s foreword to the book. The fact is that we have seen some of the plot ideas in Man and Superman explored in volumes such as Straczynski’s Superman: Earth One and even in Zack Snyder’s Man of Steel. The “plainclothes” look for Superman recalls the opening arcs of Grant Morrison and Rags Morales’ Action Comics. It’s always so interesting to see how different creators tackle similar concepts. While some of Man and Superman‘s elements may feel familiar, it’s all executed in an altogether different manner. Wolfman has always been a master of making larger than life characters into relatable people, and that gift is on full display in this story. This relatability is what really sets Man and Superman apart from similar stories that have emerged in the last decade. While some of the ideas for the book have been seen in the years since, that doesn’t change the fact that Man and Superman would have been something of a revelation if it’d been published ten years ago, as intended. DC has made a great choice in finally publishing this story. I hope it will set a precedent for the release of other “lost” tales.